Native to South America, alligator weed is a perennial plant that grows on land in damp soil, or on water as dense floating mats. Alligator weed affects water flow, water quality, native plants and native animals, and has major economic and social impacts. Alligator weed poses an extreme threat to waterways, wetlands and irrigated crop lands from Cape York to Queensland's southern border. 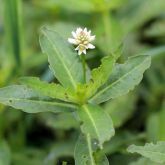 Alligator weed is a restricted invasive plant under the Biosecurity Act 2014. 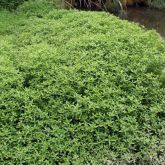 Vigorous perennial weed growing both in water and on land. 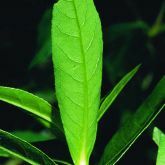 Leaves are dark green with a distinct midrib, 2-12cm long, 0.5-4cm wide, arranged in opposite pairs along stem. Flowers are white, paper-like, ball-shaped, on short stalks 2-7cm. Optimum growth occurs in fresh water with a high nutrient level. Can establish in semi-aquatic areas, wetlands, stream and creek banks, and on land. Has the potential to establish in all Queensland coastal areas, inland agricultural cropping areas, and urban areas. Forms new shoots in spring from nodes on existing stems. Does not produce viable seed. Regrowth occurs quickly from stems or underground rhizomes. Poses extreme threat to waterways and wetlands. Restricts water flow in creeks, channels and drains. Reduces water bird and fish activity. Kills fish and submerged native water plants. Damages pumps and irrigation equipment. Poses extreme threat to irrigated croplands. Increases water loss through evapotranspiration. Impedes water sports and boating access. Creates favourable habitat for mosquitoes. In water, stems break and float away to form new mats. Also spread by cuttings in soil or on equipment. 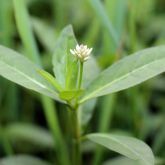 Call 13 25 23 if you find a plant you suspect may be alligator weed. 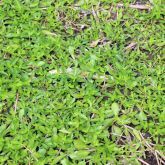 Successful mechanical removal of alligator weed is extremely difficult since the plant is able to re-establish from very small pieces. spillage in transit or at dump sites. 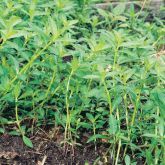 Alligator weed grows in different situations, each requiring particular herbicide controls. See the Alligator weed fact sheet (PDF, 1.4MB) for herbicide control and application rates.